The olive tree was one of the most important plants in Bible times, and it still is today throughout portions of Europe and the Middle East. 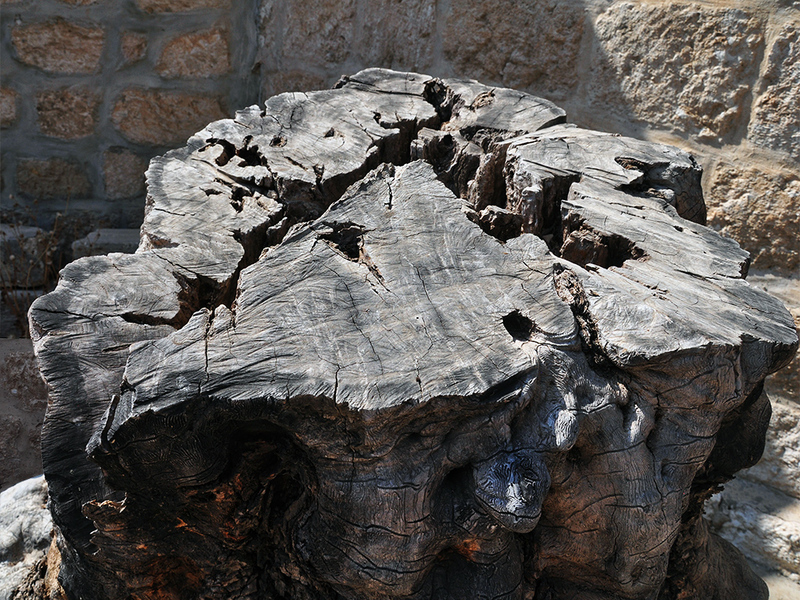 The wood of the olive tree was used in some of the furnishings of the temple (1 Kings 6:23-33). Stump of an olive tree at Beit Jamal (? En-Gannim). Photo by Ferrell Jenkins. Wood from dead or destroyed olive trees is often turned into carvings and souvenirs such as this carving of the faithful spies (Caleb and Joshua; Numbers 14:30) that I secured in Bethlehem many years ago. 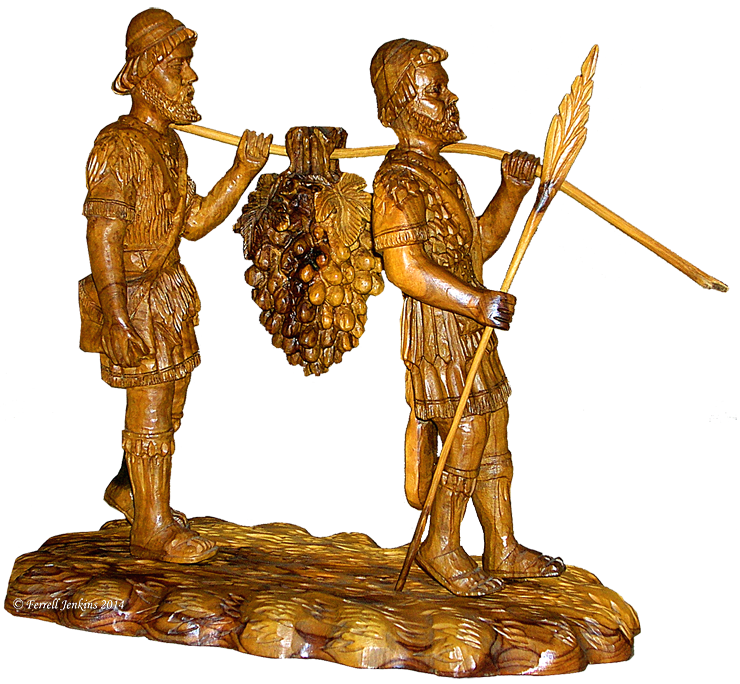 Olive wood carving of the faithful spies. Photo by Ferrell Jenkins. The Olive – first among the trees. What happens after the olives are harvested? Related minor posts about olives. The olive shoots (Psalm 128:3). Paul’s illustration of the 0live tree in Romans 11. Grafting. 1400 year old olive press excavated. A place called Gethsemane (on the Mount of Olives). Visualizing Isaiah 4: the Branch of the LORD. The root of Jesse/David. When I add other posts pertaining to olives I will try to remember to add them to this index. This entry was posted in Bible Lands, Bible Places, Bible Study, Israel, New Testament, Old Testament, Photography, Travel and tagged Flora of the Bible, olive tree, Plants of the Bible. Bookmark the permalink. Olive wood has so many beautiful characteristics! We have a few small things ourselves. Have you done any research on the acacia wood used in the tabernacle and the cedar used in the building of the temple? Acacia wood is fascinating! Sara Green, my comments about olive trees are related to neither modern Israelis nor Palestinians. These olive trees are neither Jewish nor Palestinian. I have discussed the olive tree in relation to the use in the Bible. I have traveled extensively in both Israel and the West Bank, and have Israeli and Palestinian friends. I have very clear views about what is happening in the Middle East, but that is not the purpose of this blog. I am in favor of freedom of speech, but I think you need to take your last sentence somewhere else. It does not help your cause. There are tens of pages on google re Israelis destroying Palestinian olive trees. Or are Palestinian olive trees inferior to Jewish olive trees and not worth noting? Why are you an enabler of Israeli Neo Nazis?